On the Byzantine liturgical calendar, today is the feast of John, patriarch of Constantinople, called “Chrysostom” (which is Greek for “the golden-tongued,” in reference to his amazing gift for preaching the Word of God). 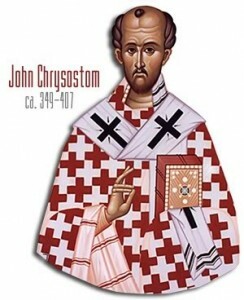 The Latin Church observes the liturgical memorial of Saint John Chrysostom on 14 September. He is revered as our holy father and for that reason he bears mention again. One of the Divine Liturgies of the Byzantine Church, the one used most days, is ascribed to him. It is hard to overstate the importance of Saint John Chrysostom for Christians due to the intensity of his person, the force of his preaching and the reasonableness of his teaching. The “Cherubic Hymn,” a chant, is taken his Divine Liturgy, is sung at the time of the Great Entrance. (For Latin Catholics, the Cherubic Hymn is a hymn sung at the presentation of the gifts, a text which is fixed for all but a few days of the liturgical year). The Cherubic hymn ought to form part of our daily prayer. Lights From the East, Pray For Us! James Michael Thompson has a new book, Lights From the East, Pray For Us! This is his second. Published by Liguori Publications, so pre-order now. The book provides a brief biography, a scripture reading, a reflection, a prayer, and a hymn for fifteen saints from the Eastern Churches. 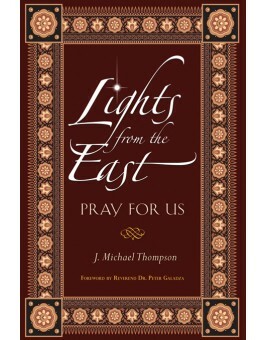 Lights From the East presents the Church’s incredible riches of some of the saints to English speakers, by giving the reader icons, biographies, Scripture, reflections, translated quotations from the service that honors the saint, prayers, and original hymns set to Rusyn or Galician melodies. Thompson covers saints of the Old and New Testaments, Prophet Daniel and the Three Holy Youths, the First-Martyr and Equal-to-the-Apostles Thecla, Martyr Barbara, Macrina the Younger, Sabbas, Xenophon & Mary, and their sons, Arcadius & John, Cyril & Methodius, Theodosius of the Monastery of the Caves in Kiev, David of Thessalonica, Maximus the Confessor John Chrysostom, John of Damascus, Martyrs of the Twentieth Century. The forward is by the Rev. Dr. Peter Galadza of the Sheptytsky Institue for Eastern Christian Studies. J. Michael Thompson of Pittsburgh is a well-known choral director, liturgical scholar and practioner. One of his major works has been the Schola Cantorum of St. Peter the Apostle of which he is the founder and artistic director. Thompson has served as professor of ecclesiastical chant at the Byzantine Catholic Seminary of Saints Cyril and Methodius in Pittsburgh and was the cantor/ director of music at the Byzantine Catholic Cathedral of Saint John the Baptist in Munhall, Pennsylvania. Monsignors Francesco Camaldo, Pier Enrico Stefanetti, Diego Giovanni Ravelli, Guillermo Javier Karcher, Marco Agostini, Masi Jean-Pierre Kwambamba, John Richard Cihak, Kevin Gillespie, Massimiliano Matteo Boiardi, F.S.C.B., and Vincenzo Peroni. 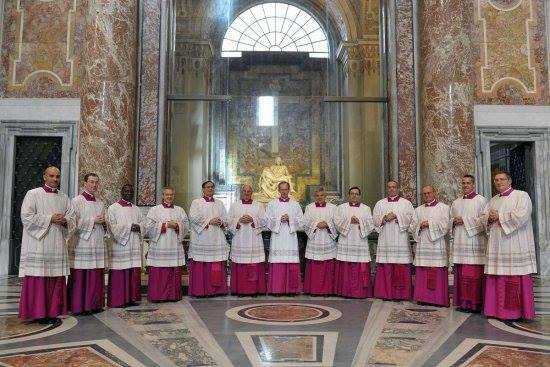 These priests serve the Church as papal masters of ceremony. Some of them have been part of this office under Benedict XVI and now Pope Francis. The MCs also assist many of the cardinals when needed in Rome. Guided by Monsignor Guido Marini, the Master of Pontifical Ceremonies. Monsignor Marini has a group of consultors in Fathers Bux Nicola, Mauro Gagliardi, Juan José Silvestre Valór, P. Uwe Michael Lang, C.O., Paul Gunter, O.S.B. The faithful way of reading the sacred Scriptures and living the sacred Liturgy, you could also say, live the Scriptures, is understand that the Lord works in our lives as he did in the lives of the Apostles. He is contemporaneous with our human experience today. The author of Second Peter is not communicating to us a doctrine, a formula, or a moralism. He’s communicating to us that he met a person that changed his life and oriented the rest of his existence. The meeting he’s speaking of was that a meeting of God in the person of Jesus Christ. An experience is not fiction; it is not a cleverly devised myth, an experience is not a casual entertaining fantasy. The meeting Peter speaks of is the keen meeting with the Divinity, and thus all is changed. We believe, based on Scripture, that the divine encounter allowed the Gospel of Mark to write, “And he was transfigured before them, and his garments became glistening, intensely white” (9:2). The economy of our salvation, that is, God’s plan of salvation given to us through the divine person of Jesus Christ, shows us that in and through creation we are brought into God’s life, into God’s existence. The natural grape is transformed into wine and by the action of the priest and the power of the Holy Spirit the wine becomes the Blood of Christ. And by the Precious Blood of Christ we are healed and saved. What does the feast of the Transfiguration have to do with the blessing of grapes? Here, and read. 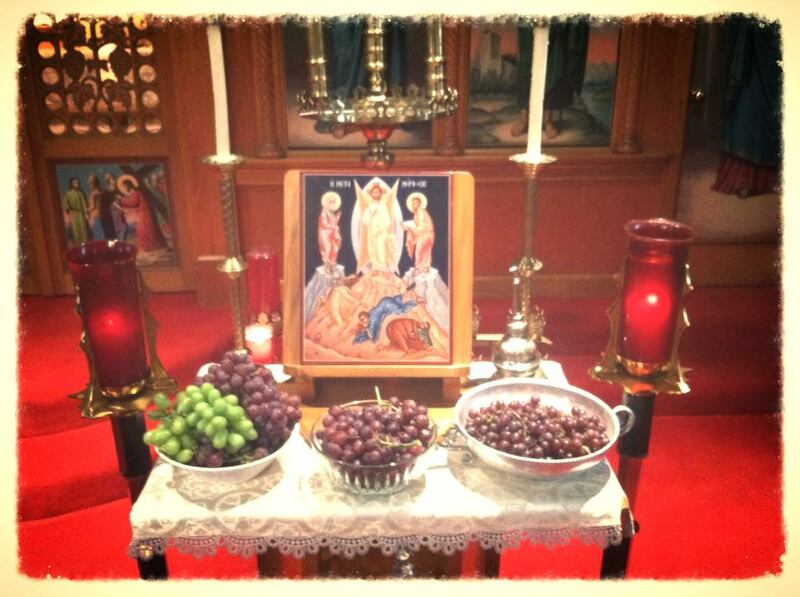 The Blessing of Grapes may be found here. I recommend that the blessing be prayed!!! How else are we to remember that we are graced by the Transfiguration? Private and Public Catholic Mass? I’ve struggled with the idea that Catholic worship is ever a private affair of the priest. A conversation with a friend has sparked this post. Our Catholic liturgical life bears the burden of always being a public event. We believe that holy Mass is an act of the whole Church hence, the regulations say, that a priest ought not to offer Mass “except for a just and reasonable cause” (GIRM 254). Even when we make the serious claim that the Communion of Saints and Angels are the only ones in attendance the Church Triumphate is present. Mass, the Divine Office and the sacraments are by nature public. So, it is inconceivable that the we could hold to such ideas that hold as ‘normal’ that there is a private Wedding ceremony, a private baptism, or a private funeral. Mass, the Divine Office and the sacraments are exercises of Christ’s work in the world and the Church’s ministry. The General Instruction of the Roman Missal (GIRM) says, “Mass should not be celebrated without a minister or at least one of the faithful, except for a just and reasonable cause. In this case, the greetings, the introductory or explanatory remarks, and the blessing at the end of the Mass are omitted” (254). There is a constant metaphysical sense of our Catholic worship. Thinking with the Church there are times when a priest, without a congregation and without a server (to represent the faithful) may offer Mass by himself. The Church teaches that every effort ought to be made to have a server make the responses and to keep the priest honest in following the rubrics, but there may be times when the priests needs to offer Mass only in the presence of the Angels and Saints. Remember, we do not hold that a priest owns the Mass for himself. Yet, we are also taught that a priest does not need a lay person for the proper celebration of the Mass. Traveling causes these tensions, or there is a need to offer Mass for a particular intention that needs immediate Divine assistance, e.g., the sick and dying, a special circumstance in society or church. A priest in a nursing home may offer Mass without a congregation. 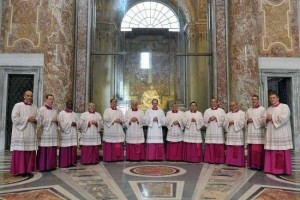 Bishops with a rare day free of public ceremonials may offer Mass privately from time to time. Jesuits, many monks and hermits frequently offer Mass in alone. All this seems to be contextualized by the Code of Canon Law that says, “This is true with respect to the liturgies celebrated by religious communities” (678,1). Ultimately, it is held by the Catholic Church that it is both licit and valid for a priest to offer Mass alone. Still, what does it mean to have a public and private Mass in Church? What does the Church tell us? With priests whose ministry is restricted, some are permitted to offer Mass privately, that is alone. 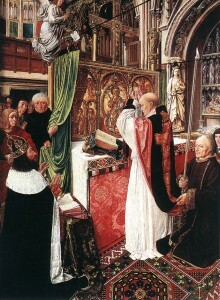 Since it is the Diocesan Ordinary that regulates the celebration of Mass and sacraments, the bishop ought to state clearly that Father so-and-so is only able to offer a “private Mass at which no member of the faithful is present.” The regulation ought not leave neither the priest nor the faithful wondering what the intent of the Ordinary is on such matters. Private has two layers of meaning: 1) alone, and 2) with a small group in a non-public oratory like a chapel in a house of nuns, or a side chapel in a church. Clearly, we define as a “private” a celebration of not having to be done behind locked doors. Rather there is no public service announcement in social media. What we mean as “public” ought to be defined as a celebration of the sacred Liturgy that’s made known to the faithful so that they can freely participate. Redemptionis Sacramentum (2004) states that the “public exercise of divine worship” is that which “the faithful are accustomed to frequent” (23). In the mystery of the Eucharistic Sacrifice, in which priests fulfill their greatest task, the work of our redemption is being constantly carried on; and hence the daily celebration of Mass is strongly urged, since even if there cannot be present a number of the faithful, it is still an act of Christ and of the Church (13). “It is necessary to recall the irreplaceable value that the daily celebration of the Holy Mass has for the priest, be it in the presence of other faithful or not” (49). Whatever the case, there is an intrinsic value of offering the sacrifice of the Mass. Priest, whatever the form, ought to pray a thoughtful and rubrically responsible in offering Mass.